Contains the 2011 Silver Eagle, Reverse Proof, Regular Proof and both West Point and San Francisco issues. Coins may show some minor toning and capsule edges may show some damage. 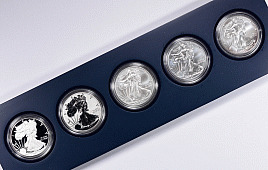 Description: Contains the 2011 Silver Eagle, Reverse Proof, Regular Proof and both West Point and San Francisco issues.